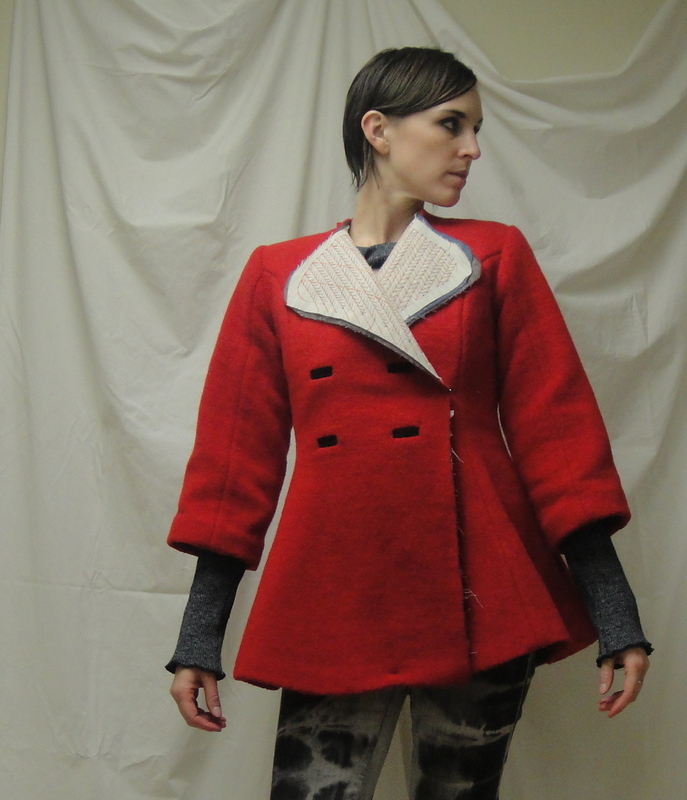 Maybe it was Laurwyn’s Coat Marathon, or maybe it was Liza Jane finishing her gorgeous red Lady Grey, but MAN I want this coat done! I want to flounce around in it, to whatever extent I can given the weather, and whip up a bunch of quick knit tops and maybe another pair of jeans (funny how jeans are something to whip up—they’re not exactly the least involved of projects, but are easily doable over a weekend). I want to be there—not getting there. But I am getting there, impatience aside. I got the lining cut, which was a major mental hurdle—then I was stymied by promptly running out of black thread. Oops. improvising. I added an inch to the CB seam to turn into a back pleat. I decided I couldn’t be bothered to re-draft the front facing, so I just cut the facing the same as the full front, which will work better with the buttonholes anyway. I should probably think about grading it for roll, but I’ll get there. The back neck facing I will topstitch into place on top of the lining. It occurs to me that I’ve completely forgotten a back stay. Again. D’oh. Unable to progress with the lining, I went back to fussing with the shell. I did the pockets, which I also had to re-draft. 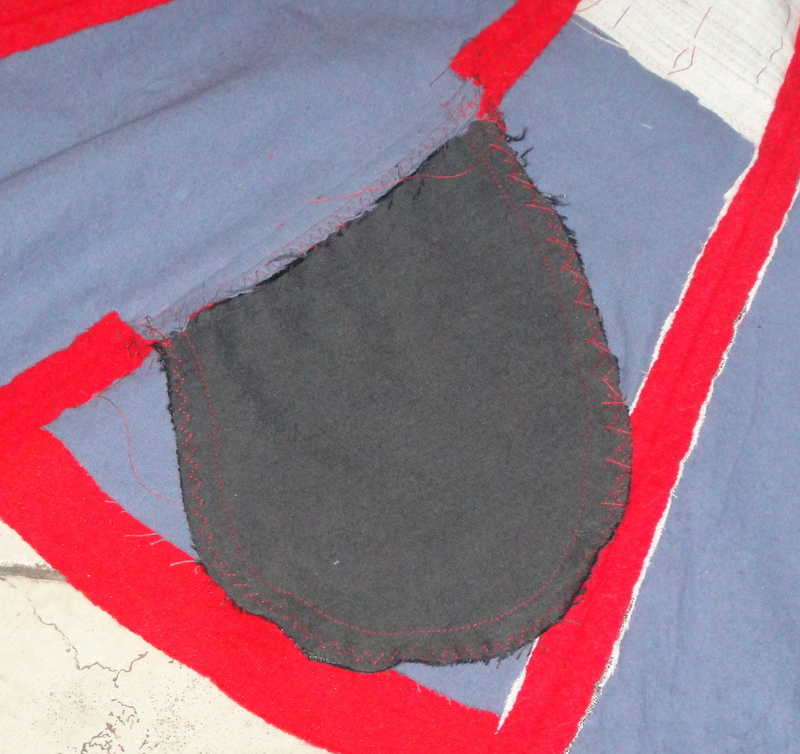 Fortunately, it’s almost easier to draft a pocket than it is to pin and cut out around the pattern piece. I had the length and position from the notches on main pattern, so I measured them, and then made a generous shape out from that that would accommodate my hand. A lot of people had trouble with the pocket drooping below the hem (the pocket is really located only a couple of inches above the hem) so I catch-stitched mine to the underlining and will make sure that the bottom is caught in the hem, too. narrow hem (1″) to preserve length and make the easing in of the top easier. I followed Gertie’s video on this, running a gathering-stitch along the edge and tightening at intervals, then steaming/pressing to shrink the fullness. It’s basted in place but still needs seam binding and to lose a few pins, hence the lumpiness in the photos. I also cut my linings to the full length of the pattern, since a lot of people found their linings came out a bit short as well. Oh, yeah. I put the sleeves on, too. Again using Gertie’s tutorial, although I substituted strips of my own knit coat fabric for the bias pieces. It worked, although I’m not sure how you gauge or control how much easing you get from it. Also that makes for a TONNE of layers for sewing around the sleeve. I had to swap out to a denim-weight needle after snapping my first one clean off. With the sleeves on, I think the back ease is just right. Now I just have to decide on shoulder pads. My construction order has been all over the place for this coat. 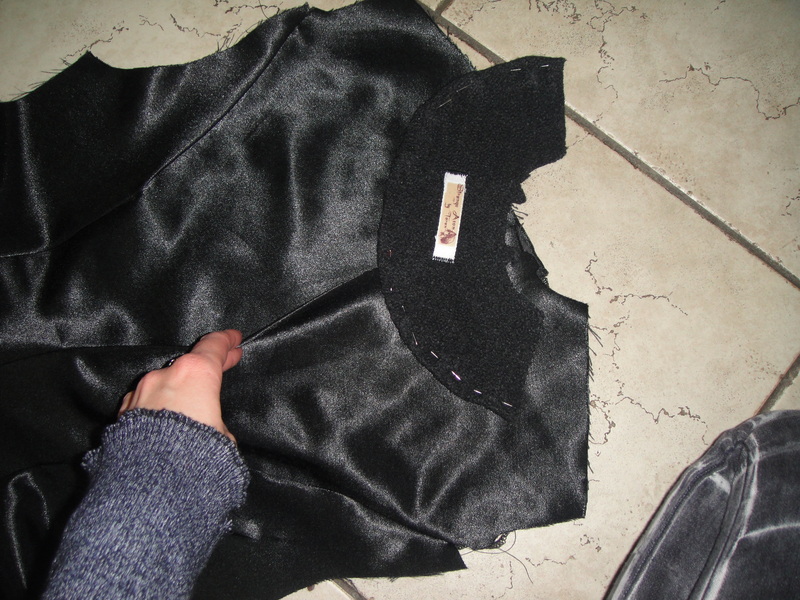 Ah well—as long as I don’t try to attach the lining before I sew on the collar or anything. I really love the colour and I know it’s going to be gorgeous when it’s done. It seems everyone has struggled with the effort involved in assembling this thing. I don’t know what it is – but it’s a painful construction process… Keep on, you will be happy once you’ve got a great new jacket. Coats in general are just involved, I guess. I don’t know that this is any worse than the other ones I’ve made, other than all the padstitching and bound buttonholes and things like that… but it’s still an awful lot of work. ohhh it’s soo close!!! heck i’m excited watching your progress! Wow, really coming along! Looks really nice. Can’t wait to see how the lapels look when done. As much as I like the pattern I didn’t think it would work for me and I just don’t have the time or patience right now to mess around regrading the lapels. Yours looks just right for your size. You are so inventive and determined, keep up the good work, homestretch now! You are getting so close. It must be a sign of coat-itis that you are thinking jeans are quick and easy!! Man, I wish I had internets while I was finishing my coat as I’ve had the same problem with the pockets and lining that it looks like other sew-alongers were discussing. Oh well, it’s done. actually a very thick knit with a bit of a felted look/texture. Lots and lots of body. So near to the finish! Push onwards. Everything is looking very good. The back flounce is especially flattering on you. The end is in sight! You are almost there. Your peplum looks fabulous. I think the weight of your fabric is perfect for this coat. And I think its smart to cut the facing the same as the front piece. On the lining, I did the same thing– cut my lining to the full length of the pattern and it just barely was long enough. I ended up slip stitching it to the shell to encase everything inside. Woot woot red lady grey club! Your coat looks beautiful! I am just about at the same stage that you are- except I only have one sleeve on so far. Are you finding that the sleeves are too large? I feel like I’m swimming in mine. But I also made them full length so that might contribute to the effect. The pockets as drafted are too small, I think. I’m thinking about re-doing them and making the opening longer and the pockets deeper. And maybe raising them up a bit? Anyway, beautiful progress on your coat. I can’t wait to see it finished! 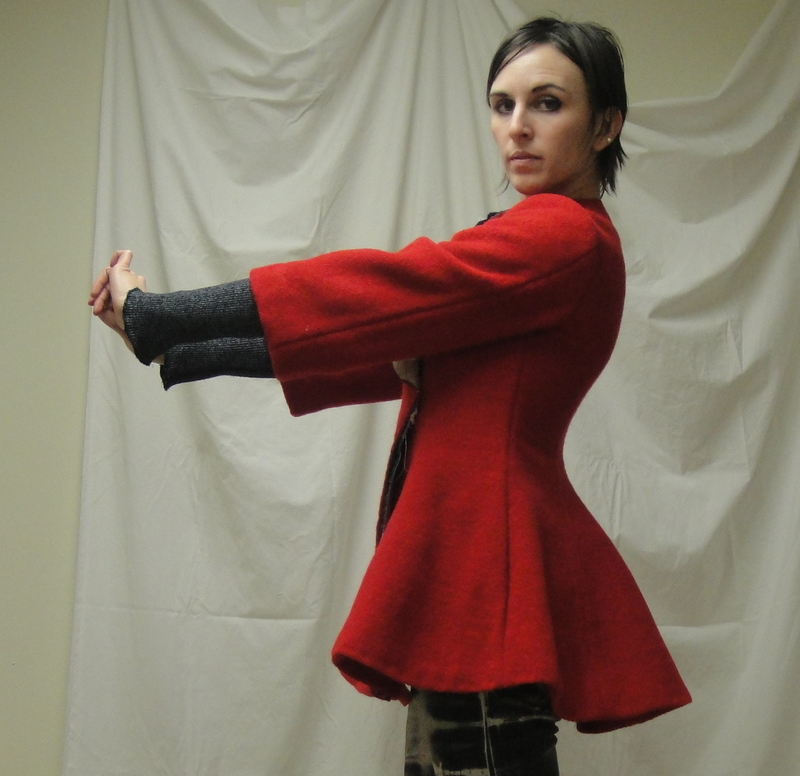 The sleeves are very wide, which is nice at a 3/4 length but I think would be a bit overwhelming at full length. I know Kbenco lengthened her sleeve, too, but I think she narrowed it at the same time. I can’t comment on the pocket as drafted since I never did find the pattern piece, but they are definitely very close to the hem. I’m curious how raising the opening works, though—presumably they are lower to keep from bulking up the waist, but it’s still worth a try. The upper CB looks fine in this shot – maybe the other one just had indoor-photography-in-a-Canadian-winter-itis! Have a great warm-and-summery Christmas!